QPR have made a £6.2m bid to sign Yann M'Vila from Rennes, but the deal hinges on whether they can convince him to join the Premier League's bottom team. That fee would rise by around £400,000 if QPR stay up and although the clubs have a verbal agreement, the midfielder is reluctant on a move to Loftus Road. Fulham are also keen on the 22-year-old and would be willing to pay £5.8m, but no formal offer has been submitted. 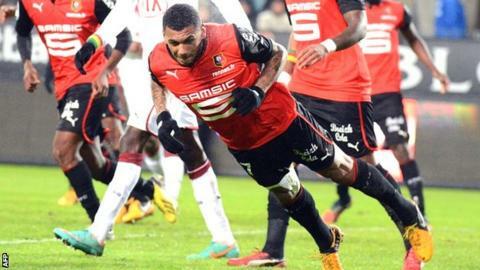 M'Vila's current deal expires in 2015 but Rennes want to sell him this month. There is interest from one other unnamed Premier League side over a loan deal with an option to buy at the end of the season - but it is not Arsenal or Tottenham, both of whom have previously enquired. Rennes's asking price last summer was almost £17m and they reportedly rejected a £28m bid from an English club a year ago. However, a series of off-field issues - including an while on France under-21 duty - have seen his stock fall. He is banned from adding to his 22 international caps until June 2014 and has made only 17 appearances for Rennes this season. QPR have already and manager Harry Redknapp is keen to add M'Vila to his squad. "I also liked M'Vila when I was at Tottenham," said Redknapp, who was in June 2012. "He's 22, played against England a couple of years ago for France, and was fantastic. "[Rennes] turned down £28m from an English club for him a year ago. Spurs offered £15m for him in August. "The deal looks OK. M'Vila's had a few off-the-field problems. If he behaves himself, and plays as we know he can, he'll do well."